Arrived at this hip new joint on main and I was quite taken with the baker. He is taking ROWS of bagels out of the fire oven with a long wooden stick. Then with a loud smack they all go flying in the air and into a bucket!! Today I am having a buttered cinnamon bagel. It's almost like french toast. 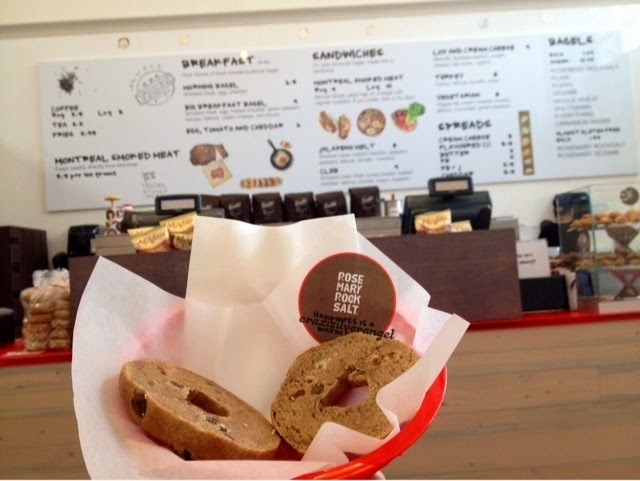 I also got to try their breakfast bagel, that was really yummy and I'm glad it's not drowned in oil. Usually I order rosemary rock salt. It's like unique herbal aroma and taste, finished off with some salt. It's even better with a "light" spread of their dill cream cheese. If you ever get a chance to go, it's right infront of the bus stop on main st.